Hospitals across Egypt have declared a state of emergency following two deaths earlier this week from the H5N1 virus, or bird flu. An Egyptian woman died on Tuesday from the virus, the second bird flu death in two days and the third this year. The 30-year-old woman, from Minya governorate in Upper Egypt, contracted the virus after she came into contact with infected birds, Egypt's health ministry said in a statement. The first fatality this week was a 19-year-old woman who died of the disease on Monday in Upper Egypt's Assiut. Meanwhile, Alexandria's health ministry declared a state of emergency in all of its hospitals after the two deaths, Al-Ahram's Arabic news website reported. Ayman Abdel-Moneim, an official in Alexandria's health ministry, told Al-Ahram that the governorate started taking intensive precautionary measures in various hospitals. Abdel-Moneim also stressed that there is a huge quantity in all the governorate's hospitals of the drug Tamiflu – which treats flu symptoms. A total of seven cases of bird flu have been recorded this year, three of which have died. Aida Abdel-Mohsen, head of clinics at the National Research Centre, told Ahram Online that the peak of bird flu was in 2008. "The health ministry has preventive plans that have been implemented since 2008," Abdel-Mohsen added. She also stressed that the flu only gets stronger during the months of January and February, and that the ministry only starts taking preventive steps in mid-December. Al-Ahram's daily newspaper quoted the ministry on Thursday as saying that a total of 180 patients have been diagnosed with the H5N1 virus since it first appeared in Egypt in 2006. 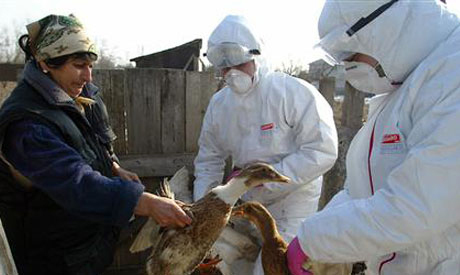 In May, the United Nations Information Office held a briefing about the status of bird flu in Egypt. Egypt has 26 percent of all bird flu cases in the world, according to Henrik Bekedam, a World Health Organisation representative in Egypt, who added that that disease has infected 660 people worldwide, killing 175. Bekedam told Ahram Online that the risk of the disease to Egyptians was still palpable, citing the way people handle poultry as the key factor. H5N1 was first reported in Hong Kong in 1997. It then spread in 2003 and 2004 from Asia to countries all over the world, infecting hundreds and killing many. Egypt has identified 180 cases of bird flu since 2006, 65 of whom (36 percent) have died, the health ministry said in a statement.